The place that I took photos of coconuts cutting, named Laupahoehoe (it means a flat of smooth lava,pahoehoe), has the tragic history. 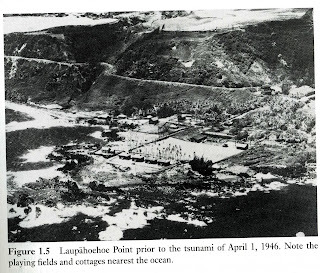 April 1,1946, Tsunami attacked this peninsula and killed 24. The source of this Tsunami was the Aleutian Islands and killed 159 at the whole Hawaii Island. Maximum height of wave was recorded 55 feet. 14people had Japanese name, such as Fujimoto Toshiaki 14 years old, Ishizu Mamoru 16 years, Yamamoto Jitsumi 14 years. At that time around there were sugarcane producing district so many immigrants from Japan lived there. The picture of Laupahoehoe prior to the Tsunami.(TSUNAMI! University of Hawaii Press) Note the playing fields and cottages nearest the ocean. Present High Way is passing at the top of the cliff, not the road on this photo. This book contains many stories. For example, someone said that sea had receded and ocean floor was bare but everybody thought it was a April fool joke. Someone went to seawall to see the strange sea and was swallowed up by the wave. Other student who belonged basketball team could run faster by terror and achieved safety. When his head cleared another boy found he was floating in debris and in the company of sharks. The picture of soon after the Tsunami. 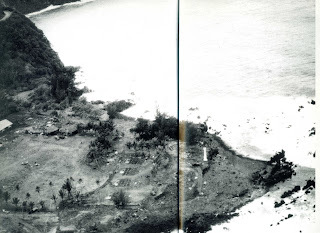 (from "The Tsunami" by Walt Dudley") All cottages were swept into the sea. The row of Palm trees of left blow are the one which workers were cutting off the coconuts. Site of the Play Ground. It has peaceful appearance now.